Ike Sewell, "Pizzeria Uno Opens"
If you ever ask someone to describe Chicago, they might tell you its the “Windy City,” or maybe name a few of its famous residents ( the Bears, the Clubs, the White Sox). They might say “hot dogs” or “Italian beef,” “Michigan Avenue” or the “Sear’s Tower.” However, no description is complete without mentioning one of Chicago’s most iconic foods: pizza. 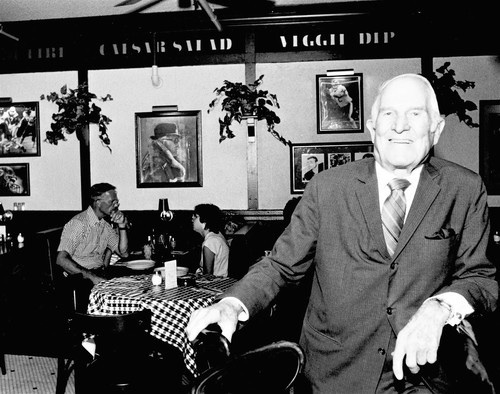 Invented in 1943 by Ike Sewell, owner of Chicago’s Pizzeria Uno, Chicago-style “deep-dish” pizza has gained fans across the globe. Unlike the traditional Italian thin crust pizzas, the Chicago “deep-dish” is marked by three characteristics: (1) enormous amounts of cheese and a thick, sweet pastry shell crust; (2) very high oven temperatures (600 degrees Fahrenheit) while baking, with plentiful amounts of cornmeal sprinkled in the pan to help insulate the bread; and (3) very long cooking times (50 to 60 minutes for a medium-sized pie). Although the recipes vary at some of Chicago’s best known pizzerias like Gino’s East, Giordano’s, and Lou Malnati’s, the deep dish remains a hearty meal necessitating a knife and fork.